Insta360 is releasing a new accessory that makes bullet time videos easier with the Insta360 ONE. When Insta360 ONE (reviewed here) was launched last year, they created a sensation with their bullet time effect. It enables the user to swing the Insta360 ONE around and capture a super slow motion view around the user that looks like the bullet time scenes from the matrix. A few weeks later, I created a tutorial for the bullet time effect with almost any camera. The key was to use a handle with swivel. No word yet on cost or availability. The Chinese New Year holiday, which is the most important holiday in China, and lasts a week, begins February 8. If they haven’t launched it by now, I don’t think we’ll see it until after the February 15.
even on their Valentine bundle is not coming the swiveling handle. I truly believe customers are asking for it, that a lot of current customers will buy it (I will do depending on cost for sure). 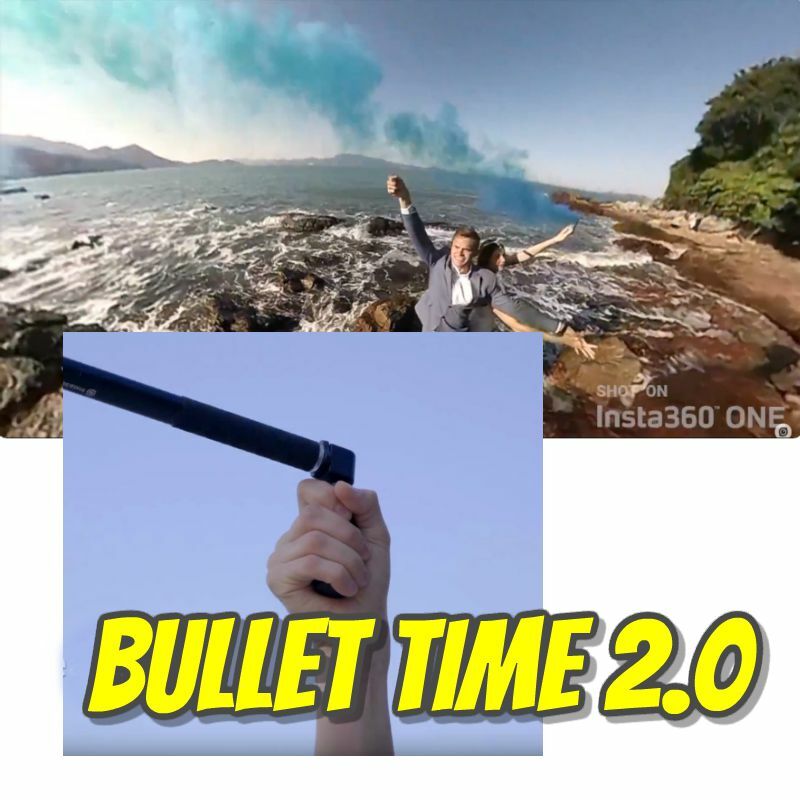 I wonder if that “bundle” with the selfie stick is their way of getting rid of their current stock of “regular” selfie sticks so that they can in a few months introduce their “all new” bullet-time selfie stick ! Many enterprises proceed that way. For example, you will see a software at a very low price and then two months later, there is the new version of the software at regular price… Same thing with cameras where the price goes down a lot and then a month later there is the all-new model ! I imagine this would work just as well with other 360 cameras such as the Mijiia…Its just a 90 degree handle with a swivel, I wonder if a third party solution could be found elsewhere? Watching their clip a few times, I wonder just how many times people will be shooting bullet-time selfies. It’s bound to get repetitive to watch after a while – seeing people twirl this thing around themselves with their arm extended. Watching that couple do a few imaginative things with it was kinda fun, but would we watch dozens of these ? Surely, seeing a bunch of twirling selfies of some guy with the inevitable statue of liberty pose in every shot is definitely going to get boring real fast !